All’s well that ends well, or is it? At long last the issues with Aperture have settled down and the app is behaving normally. I read periodically on forums that users are still unsure of the viability of installing 3.1. The only caution I would mention is just be aware that once your libraries are updated you cannot revert to a previos version of Aperture, it’s a one way street, and if you get stuck, heaven help you. Having said that the 3.1.1 update has it’s merits and is worth the effort. Although in the interim when Aperture was down I discovered that Lightroom is no lightweight and is a serious contender. Apple beware, Adobe are doing their homework. The update solution and now obviously the crash solution are posted here for reference. The following actually works in terms of allowing an install of the 3.1.1 update for Aperture, where the update is downloaded from Aperture support. Have yet to find a solution for Aperture crashing on opening…..have done everything possible. After an extensive search of the App Store I find what I have overlooked, the little Support button on the main page under Quick links. 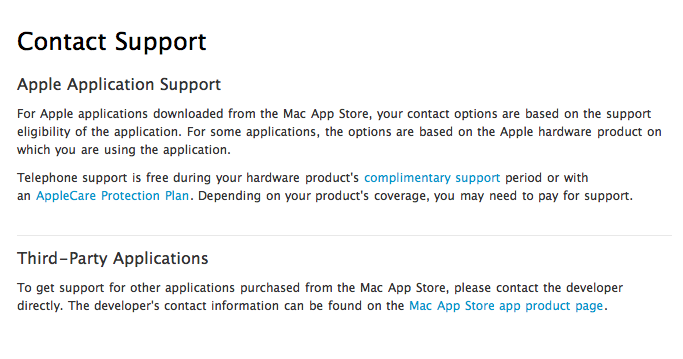 Once you get to the Mac App Store support page you only have two options for Contact; Applications, which drew zero result, none of the FAQ’s related to my problem, and there was no option for Contact, and Accounts and Billing. So it was off to Accounts and Billing. Whilst Accounts and Billing may seem to be an odd place to end up with a problem like this, it was the only place where I could post information, and get some sort of response. Maybe it will end up in the right hands further down the line, wish me luck. and there is not much you can do with it. Can you imagine trying to explain the content of the last two posts over the phone? So I had to provide a brief outline in the space provided and a link to this post, what are my chances? I’d read about it and periodically heard first and second hand accounts about people experiencing problems with Apple products and services and sat back thinking wow… that’s never happened to me, at least not until today. In 7 or so years of using Apple products and software, not so much as a hiccup has come my way. Faith in all things Mac justified. Yesterday (10th Jan) in the early evening, unknown to me, all that was about to change. The new Apple App Store was open and software was going at ridiculously cheap prices, but my radar was down and my default “hang on a bit, why so cheap’ warning light failed. Seduced by the possibility of obtaining the updated version of my much used and heavily relied upon, Aperture, for a song, I succumbed to temptation and made my purchase from the newly proclaimed ‘Queen of Cloudland’. Suspecting all was well and that Apple would have all bases covered, I completed the transaction and the paid for the upgrade which seamlessly downloaded and installed without a glitch. I upgraded the libraries, despite the warning that upgraded libraries would not be accessible to earlier versions of Aperture….trusting soul that I am, what could possibly go wrong? Once installed, Aperture 3 exceeded my expectations and I can certainly say that if you are considering the purchase, do so with complete confidence, just not from the App Store. I checked the status of the app and found that it was open but not responding, just my desktop staring me in the face, waiting, like someone outside a closed bank. Force quit and re open, the ritual seemed endless. Maybe I need to re-install, where’s the dmg from yesterdays download and install? There is none! Despite the App Store Help site touting that a saved copy of the app could be used to reinstall, no option for saving the install dmg appeared at any time during the download and install of Aperture 3 and a thorough search failed to locate it. Not only did I not have a dmg of my purchased software, you also don’t get a serial number. Whilst you get an order number on your receipt, an order number does not prove you have the product, where as a serial number does, so how are you supposed to obtain support for a product that you can’t prove/verify you own? 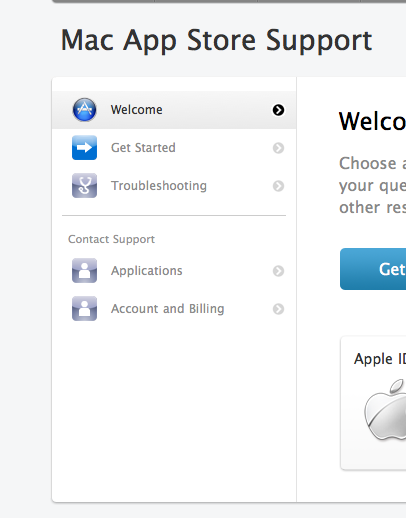 What if the serial number is on the splash screen? Great……but I can’t even raise the splash screen. A better option is required for crashes like this. Things were not looking good. Suddenly the extra you pay for the boxed version began to make sense, more outlay but….you have the install disk, serial number and a support ID number. My options were getting thin. After a thorough scouring of the App Store support site I scored a zero return, what happened to the traditionally good backup provided by Apple? Bright idea…what if I download the 3.1.1 update and reinstall this over the existing installation. Back to the App Store, follow the links for Aperture to the in-store page that has the updates, download and install, error message “you can only install updates for this product from the App Store”, hadn’t I just done that? I realised I was lost in glitch city, what to do next? Suddenly I’m in no man’s land. What if I re-install my copy of Aperture 2 and download my purchase from the App Store? Aperture 3 is no longer on my system, so if the “if you delete your software you can reinstall it from the App Store as long as it’s still available” is correct advice, I should be able to remove and re-install. and no option available to re-download the software that I had paid for. $100 down the drain. Only option now is to purchase the boxed edition and get on with life, otherwise my libraries become coffins. If you use this application professionally and you are considering upgrading or purchasing for the first time, stay away from the App Store, buy it boxed online or from a local retailer. I’ve certainly taken a hard lesson today and won’t be back under any circumstance until Apple get their act together and provide the basics, like most other online traders that allow you to purchase via download, do. It’s irresponsible for Apple; and ultimately damaging to their reputation, to offer software that is used professionally without appropriate backup and support. Great software, lousy delivery and support from the App Store for this application.